Just because product testing has to be rigorous and precise doesn’t mean it has to be boring. The guys over at Kno decided to leave the laborious task of testing the dual-touchscreen Kno Textbook Tablet to a DIY Lego robot. Kno way! The new "employee", rather unfortunately named the Accelerated Life Test Apparatus, is basically a long Lego-brick arm gripping a stylus, which moves back and forth, left and right. The aim of these tests is to see how well the LCD screen will respond to a non-robot trying to take notes on the tablet. 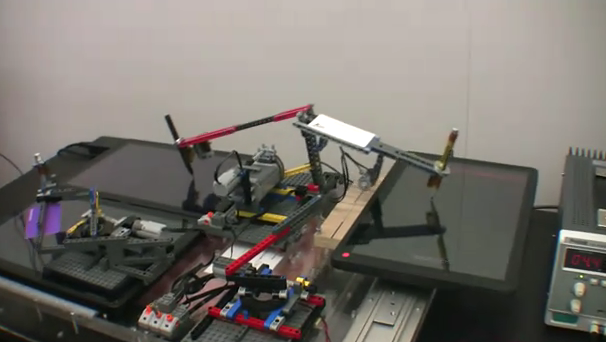 Check out the Kno’s informative video above of the Lego bot doing its thing. Although the idea of a tablet that has had some interaction with Lego may be a selling point enough, sadly you will only be able to get your hands on the $599-$899 Textbook if you are a student or teacher, invite only.